In the house of a Bussetto merchant, one Antonio Barezzi, there was often heard a deal of good music, and the young Verdi did not fail to go thither frequently to stand under the windows and listen. The continuance of this act did not escape Barezzi's notice. One day he beckoned to the boy and said to him, "Why are you standing there so still?" "I play also," responded Verdi, "and it is such a pleasure to hear others play." Encour­aged by the intelligent and charming atti­tude of the boy, Barezzi invited him to come inside, and from that moment, delighted with his wonderful comprehen­sion of music and his lovely and lovable character, began to regard him almost as a son. At seventeen years of age Verdi had finished his course at the Bussetto school, and was now to go to Parma for his university studies. His father, however, could not afford to send him thither. There was no other alternative for the young man than to till the ground as his father had done, or to seek some other way of livelihood so that he might continue his own education. In order to go to Milan, then the most important center of music, he applied to one of the endowment funds for young men controlled by the Bussetto Municipal Pawnshop, and was successful. The portion of the endowment which he received was a small matter - twenty-five lire (five dollars) a month. The good Barezzi, therefore, took upon himself to contribute something towards the young man's expenses, so that the latter might have enough to keep the wolf from the door. At that time Verdi's baggage con­sisted of a few clothes, much courage, and some musical compositions. He presented himself at the Milan Conservatory of Music. Strange to say, the professor in charge, after having placed Verdi at the piano, and after hav­ing examined his compositions, gravely declared the young man to be inept; hence he could not be admitted to the Conservatory. Human judgment often errs, said Ariosto, and Verdi, ever the unwearied reader of that great poet, undoubtedly often thought of the justice of the quotation. Nothing more discouraging could happen to the young man than to see the door of the Conservatory irrevocably closed in his face. Neverthe­less, no matter how hard the unexpected blow, he did not permit himself to be prostrated by it, but, lending a willing ear to the counsel of a friend, began to study privately under the direction of the mas­ter Lavigna. For three years he existed in a poor little room, spending only what was necessary to keep soul and body together. With increasing fervor and surprising tenacity he consecrated him­self to the study of counterpoint, com­position, and orchestration. His recrea­tions were found in the reading of the classics and of the Bible. At the end of this period the organist of the Bussetto church died, and Verdi was offered his post. He accepted it and returned to his own community. Aside from presiding at the organ, he was compelled to give music lessons, and this latter labor, though contrary to his notions of what he wanted to do, was discharged always with conscientiousness. Later he married the daughter of the protector who had been more than friend to him. At the beginning of 1839, having saved about a thousand lire (two hundred dol­lars) from his meager stipend, Verdi de­cided to return to Milan, hoping to succeed in the effort to have an opera performed. He had written this opera during his years as organist at Bussetto. The project was not an easy one to carry out, but in the end the opera was put on the stage. "Oberto," if not a success, was, on the other hand, not a failure. The opera was brought out at the Scala Theater in Milan, and was sufficiently significant to induce the impresario, Me­reIli, who had already noted the promising qualities of the young composer, to ask him to write three operas, one of which should be a comic opera. MereIli wished to present these works to the public the following year. Unfortunately, Verdi was struck down by illness, but as soon as he began to get well commenced to write. An infinitely crushing sorrow, however, came, first, in the illness and death of his two sons, and, second, in the death of his wife. From their bereavement Signora Verdi had never rallied, and, being attacked by congestion of the brain, followed her children to the grave. With his soul torn by affliction, and every force prostrated by the crush­ing out of the tenderest ties of life - it was at this terrible juncture that Verdi was called upon to write a comic opera! It was a duty, however, and must be met. Verdi wrote the opera, and the fol­lowing autumn, as Merelli had requested, it was presented to that inexorable judge whom we know as "the public." That public pronounced a sentence of death upon the work; it was hissed off the stage. On the morrow Verdi went to Merelli and asked him to release him from his engage­ments. Merelli consented, but reminded Verdi that whenever he wished to renew the contract he would find a favorable reception. The young composer's life was now more than ever solitary, If, finally, he conquered his isolation and his inertia, it was due to a fortuitous circum­stance. Merelli had asked the composer Nicolai to write the music for a libretto entitled "Nabucco," but Nicolai had de­clined. Happening to meet Verdi one day, Merelli told him about the circum­stance and begged him to assume the work which Nicolai had refused to do. When Verdi got home, it was late and he went to bed, but before putting out the light he thought he would glance over a page of the libretto. Fortunately, his eye fell upon that scene in the third act in which the enslaved Hebrews were to sing a chorus. This situation suddenly struck the fancy of the young composer. He saw in the fate of the Hebrews a similar circumstance to the unhappy condition of his own country, at that time oppressed by the foreigner. He was not able to close his eyes the entire night, so much was he overmastered by the idea of the chorus struggling for life within him. The next day he went to Merelli's house to return the manuscript. "Well, what do you think of the libret­to?" asked the impresario. "Capital," replied Verdi. "Take it, then, and turn it into music," rejoined Merelli; but as Verdi was apparently not quite decided to do so, Merelli cut the matter short by putting the manuscript into the composer's pocket and thrusting him out of the door. In three months the opera was written, and in March, 1842, Verdi obtained his first triumph at the Scala Theater. The now famous chorus of the third act was immediately understood by the public. Electrified by such music, the auditors broke into long continued applause. "Nabucco" was the signal for Verdian triumphs which from that time advanced in increasing scale. Verdi was a true patriot. Knowing the power which music exercised over his countrymen, he determined from the first that his genius should serve to keep alive among them the sacred fire of liberty. "I Lombardi," "Ernani," "Attila," "Gio­vanna, d' Arco," "La Battaglia di Le­gnano," "I Vespri Siciliani," are all of them operas which, whether by patriotic subject matter or by their clever allusions, caused spirited exhibitions of love of country whenever they were presented in Italian theaters. These manifestations were generally repressed by the Austrian police, sometimes with bloody results, always with the prison as a penalty. If the Austrian censors could mutilate the libretti of Verdi's operas (substituting, for instance, for the word "liberty" the word "loyalty"), they were powerless to change the music. Indeed, for many years they were ignorant of what the cry "Viva Verdi" really meant, and permitted it to be used, to the great glee of the people. Finally the Austrians' discovered the double meaning. By a happy and mys­terious combination of fate, the name Verdi contains in itself the initial letters of the name of that monarch in whom united Italy had placed its hope. 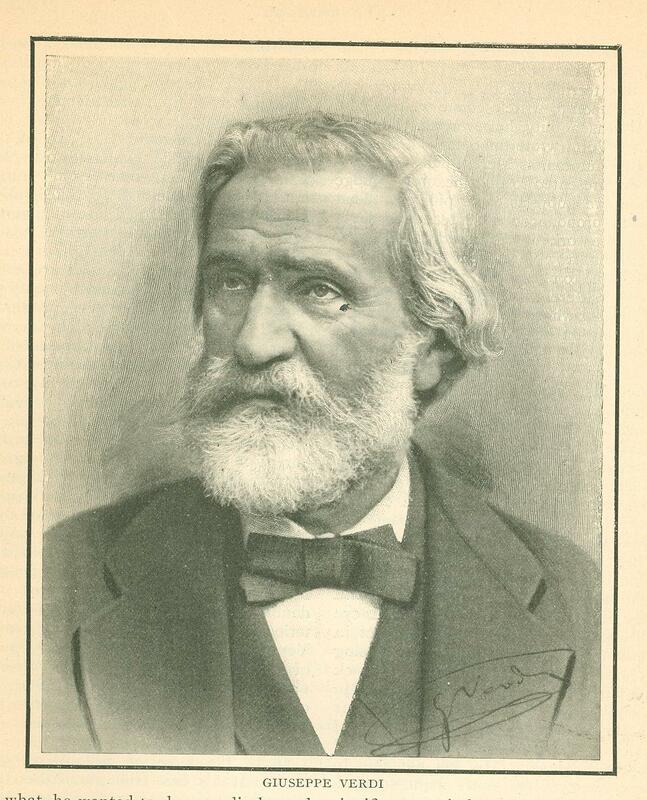 Ac­claiming Verdi, Italians thereby ac­claimed also" Vittorio Emanuele Re D' Italia." If, by the force of will, Verdi had arrived at his first triumph, neither that triumph nor its successors ever intoxicated him. Amidst the plaudits of the public on the one hand, and, on the other, the attacks of destructive critics, Verdi imperturbably pursued the even tenor of his way. His own will power reveals to us his genius as could nothing else. This, coupled with a true modesty and a profound love of art, not only preserved that genius, but made it vividly manifest in all its various forms. He never considered the possibility of resting on his laurels. He always felt that he could do better than he had done, and that he must do better. He followed this maxim to the end. He now met a woman of great artistic worth, who, by spiritual nature and exquisite culture as well, was fit to be his mate. Giuseppina Strepponi left the stage for him and became his wife. 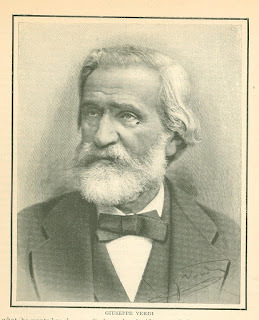 In the year 1867 Verdi lost his faithful friend and second father, Antonio Barezzi. The last words of Barezzi were, "My Verdi, my Verdi!" In the adjoining room Verdi had a short time before played for his dying friend, and this play­ing had comforted both; they went back with ears and soul to the Hebrew chorus and to its deeper meaning of an Italian cry for a lost Fatherland long since regained. Verdi's outer life never gave a false impression of his inner life. He was a man of simple tastes, of affable and generous nature, one who knew not envy, who was never tormented by jealousy. Con­scious of his own merit, he recognized and appreciated that of others. He loved, with an immense love, nature, tranquility, study, work. He always preferred to study on rainy days, while he found in days full of sun and serenity a greater inspiration for his writing. He was a sincere admirer of Palestrina, and would repeat to the young composers who sought counsel of him, "Study the antique. Let us return to the antique." Nor was he ever tired of reading the classics - chief among the Italians, Dante and Ariosto, and, among foreigners, Shake­speare, Schiller, and Goethe. He was a capital critic of painting, and, after the greatest names, thought specially well of Correggio and Guido Reni. Apart of every year he spent at Genoa in the palace which once belonged to the great Admiral Andrea Doria. From this palace Verdi could see the harbor and the distant horizon of the Mediterranean - a blue line which he loved. The rest of the year he spent at his villa near Bus­setto, where he devoted himself largely to farming. He took a keen delight in this labor. The wealth acquired by his genius was spent by him in good works. At Bussetto, for instance, he founded a hospital, and near Milan a splendid home for indigent artists whose age did not permit longer labor. It is fitting that in this home the remains of the grand man were deposited, venerated by all who love art and country. Born poor, of simple life, he wished that the same simplicity which had characterized his life should accompany his body to its last resting place, and these wishes were respected. The Italian Government, interpreting the will of the nation, had long since con­ferred upon Verdi the dignity of a life­ senatorship. It has now fulfilled another duty to be acclaimed with applause by all. It decrees that the little hut in which the great master was born shall be a national monument. Verdi's music may be divided into three different periods, each one of which fol­lows an ascending scale and brings a clear picture of the age in which it had its origin. The first period carries us from "Oberto" to" Stifellio;" the sec­ond, from "Rigoletto" to "Don Carlos;" the third, from "Aida" to "Falstaff." The first period may be distinguished by a certain energy of passion quite in con­trast to the morbidness of Bellini and the artificial elegances of Rossini. The change acted healthfully upon the public, and stimulated its critical opinion. The sec­ond period was one of yet greater accu­racy and refinement. It was a period in which we owe that splendid quartet in "Rigoletto," where tragedy and comedy, well divided, still offer to us a marvelous ensemble. There are in it the cries of rage and of grief, groans and maledictions, gay laughter, the sound of false kisses and trivial playfulness. "A wonderful art!" exclaimed Blaze de Bury," which made out of this scene, so powerful from a dramatic point of view, a thing irresist­ibly beautiful from the point of the abso­lutely ideal in music." Finally, the third and greatest period was one in which Verdi surprised the world, displaying new energy. He mod­ernized himself and his work without copying anyone; yes, without losing an atom of his own individuality. He showed a youthful vigor united. to the profound experience of age. "Aida," the "Re­quiem Mass," "Otello," and" Falstaff " are masterpieces, and will be more and more appreciated; yet these masterpieces were produced by the genius of a man between eighty and ninety years of age! We shall know soon whether he left other works which have not yet seen the light. It is rumored that among these there are some sacred pieces, a cantata, and other manuscripts, but nothing is as yet known positively. Originally published in the Outlook Magazine. 1901.